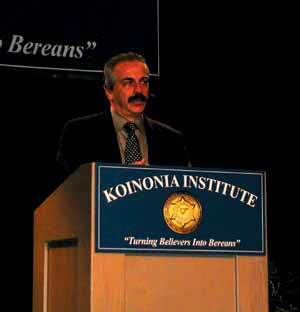 The First Annual Koinonia Institute Conference was held at the Coeur dAlene Resort on November 17-19, 2006. 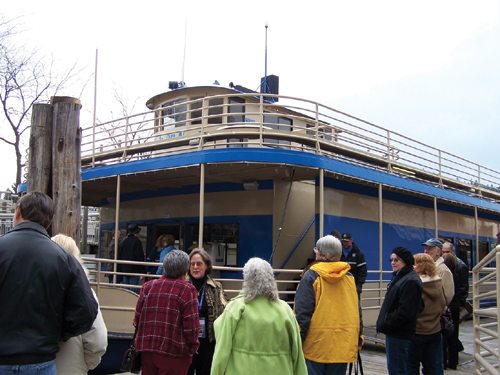 The theme was Strategic Perspectives, and it was fully sold out, including the breakfast cruise on the lake Sunday morning. We had attendees from all over the world, including Europe, New Zealand, and Israel. Many seasoned guests exclaimed that it was the best conference they had ever attended! One of the major highlights of the conference was a candid briefing by Joseph Farah, the founder and Chief Executive Officer of the premier news service on the Internet: WorldNetDaily.com. His session was titled, Imagine a World Without Israel, and it was extremely provocative. Having just returned from our Insiders Briefing in Israel with the Israel Defense Forces, the Mossad, and the Knesset, I included our summary of the challenges they are currently facing, with the expectation that Iran may have nuclear weapons capability by March of this year. And if that news isnt troubling enough, it also appears that Irans President, Mahmoud Ahmadinejad, has made his intentions to employ these nuclear weapons manifestly clear: he intends to use them against both America and Israel as soon as he has the capability. John Loeffler was at the top of his form with a penetrating and provocative presentation of Cultures in Conflict, in which he summarized the worldview wars currently being waged. Bill Koenig, our Washington correspondent, explored"in depth"the correlations between the continuing judgments on America (including earthquakes and hurricanes) and our pressures on Israel to partition their land. Tommy Ice, Executive Director of the Pre-Trib Study Center at Liberty University, profiled where we are apparently heading in the End Time Scenario. Bob Cornuke revealed a number of previously undisclosed discoveries from Jabal Al-Lawz and other recent adventures of his. Always a favorite with our crowd, Avi Lipkin was here from Israel, and he expertly profiled the historical context of Islam and its current threat worldwide. There were private briefings for the Teaching Assistants present at the conference, as well as an open Roundtable Panel Discussion with all of the speakers Saturday evening. We were extremely fortunate to have Richie Furay and his band lead worship several times throughout the weekend. 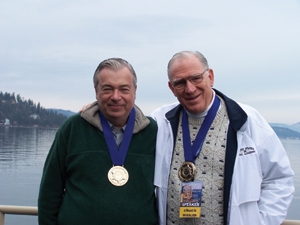 There were drawings for prizes, including an encoded cryptex (a replica from the Columbia Pictures movie, The DaVinci Code); several iPods, loaded with commentaries and briefing packs; and prepaid scholarships for Bronze, Silver, and Gold Medallions. A highlight for many was the breakfast boat cruise (see below) on Lake Coeur dAlene Sunday morning with the speakers and honored guests. All of the sessions from the conference are now available. Choose individual titles on Audio CD, or get the entire conference on DVD, Audio CD, or MP3 CD-ROM. Pray about joining us next year in beautiful Coeur dAlene, Idaho.